The AdderLink ALIP-Gold offers secure, high performance internet or dial-up access to your computers or servers with DVI (VGA with passive adapter), audio and USB support. The AdderLink IP Gold adds support for digital video, audio-via-IP, USB keyboard and mouse and virtual media support to the AdderLink IP family. Providing remote keyboard, video, mouse, and audio access via IP to your current KVM switch, the AdderLink IP Gold allows management of your computers from anywhere in the world securely and remotely via the Internet, VPN, dial-up link or corporate network. 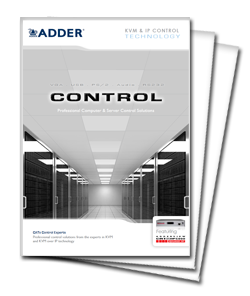 The AdderLink IP Gold doesn't need any software to be loaded on your servers and is easy to set up and use. 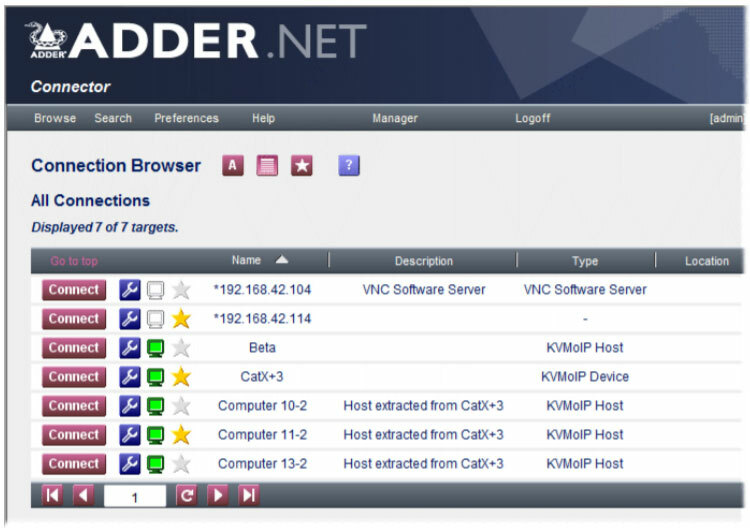 The Adder ALIP-Gold uses Real VNC client software that, unlike HTTPS web browsers, is designed for secure, high performance KVM via IP applications. Enterprise grade security (using AES 128 bit encryption and RSA 2048 bit public key authentication), with added encryption of RealVNC. ALIP-GOLD enables you to remotely access and control your computing hardware remotely using your standard IP network (WAN or LAN) via a web browser. ALIP-GOLD also acts as a RealVNC server with RFP 3.3 support, that can be accessed via Real VNC client software. Unlike software based solutions, the AdderLink ALIP-GOLD gives full control of a computer even during boot up, BIOS level or computer crash states. The AdderLink ALIP-GOLD will work even if the controlled devices are not operational. Easy on-screen-display driven set up and configuration provides a centralized, secure and intuitive user access management interface, where up to sixteen user profiles with defined access rights can be created. Each user station can be granted different access permissions on a per computer basis including View only, Shared, Exclusive or Private. The use of DVI-I interfaces overcomes the limitations of analogue video and allows for greatly improved video update and pixel-perfect performance. However, where no digital feed is available the AdderLink IP Gold will auto sense and support an analogue input. The ADDERLink IP Gold can be accessed by a standard web browser but for superior graphical performance, a Real VNC viewer should be used. Free of the limitations of HTTPS, Real VNC greatly enhances video performance. To transfer files from remote users to controlled computers, the ADDERLink IP Gold has been engineered to act as a conduit through which data can be passed. Files can be transferred via IP onto the ALIP-GOLD and onto the target computer by means of a USB virtual media port. The AdderLink IP Gold enables CD quality audio signals to be fed from the target computer to the remote user via IP. Essential for administration tools and applications where sound or audible alarms are used. The ADDERLink IP Gold has an RS232 port to allow communication to devices like power switches, allowing remote rebooting of the target computer. For mission critical applications, ALIP-GOLD supports dual power inlets (Dual-AC). If one source fails, the DDX30 will switch sources to the other power supply, so as not to interrupt normal use of the connected servers. Adder ALIP-GOLD an be used as a front end for almost any Adder or third-party KVM switch. This allows access to your KVM switch remotely over IP - essentially making any standard KVM switch device a KVM-Over-IP switch. Four extended remote users can simultaneous access each ALIP-GOLD unit. With 16 definable seperate user profiles, multiple ALIP-GOLD units can be used to create an extensive IP-based KVM switching matrix using only individual access points. Adder ALIP-GOLD units have built-in security measures compliant with universal enterprise grade security standards, inlcuding AES 256 bit encryption and RSA 2048 bit public key authentication, further enhanced by the use of Real VNC that allows for the creation of ciphered user communications. Adder ALIP-GOLD supports all known software and computer platforms with PS/2, USB and Sun keyboard and mouse interfaces, including Windows (all), DOS, Linux, Unix, BSD, Sun OS, Solaris, Mac OS, NetWare, etc. One or two ALIP-GOLD units can be rack mounted in 1U of rack space. Rackmount kits sold are separately - part #'s: RMK-ALIP and RMK-ALIP-DUAL. AdderLink IP Gold is also known as ALIP-GOLD, and ALIP-GOLD-US. Question: Can the remote unit be booted with software through the USB port ? Answer: Thank you for your inquiry. Unfortunately, we do not believe you can boot the remote computer with the ALIP Golds "Virtual Media" port. We are waiting on confirmation and will update this post if we find differently.